Spoon mixture into a 2-quart casserole dish. To make the crust: unwrap breadsticks and separate into 12 pieces. Place (stretch if necessary) 6 of the breadstick strips (flat) on top of the casserole dish from one side of the dish to the other. Arrange the remaining breadsticks over the top, either on a diagonal or perpendicular crisscross pattern. Pinch around the edges of the casserole dish to seal the ends and secure the breadsticks to the dish. Bake 10-13 minutes or until the breadsticks are puffed and golden brown. To form a woven lattice top: Place 6 of the breadsticks on top of the casserole dish. Fold every other breadstick back, making ends meet, and then place one breadstick crosswise just beyond the folded edge. Return the folded breadsticks to their original flat position. Fold back the strips that were just left flat and repeat the procedure. Repeat until all 6 breadsticks are woven into the breadsticks on the surface of the casserole dish. Oh and thanks for the vote!!! The chicken pot pie recipe looks very nice I'd try it. I love lots of extra crust on mine. 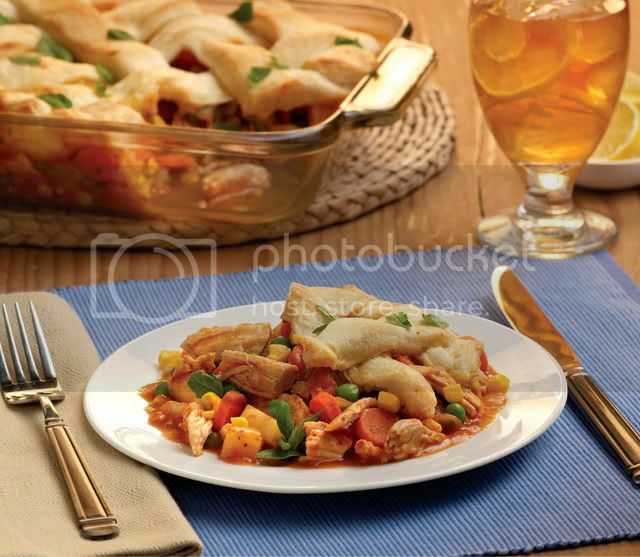 barb g.
This looks like a good recipe for chicken pot pie, one of my favorites. Just printed it out! Being Italian I have a passion for cooking :) and can say that this looks really tasty! Looks delicious and not too difficult to prepare. I might try it!